Scotland defender Charlie Mulgrew feels they can move on quickly from their friendly defeat by Costa Rica after seeing encouraging signs in the second half at Hampden. 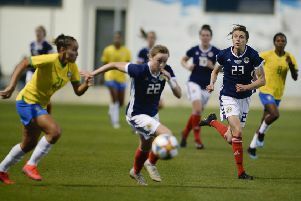 Mulgrew’s side fell behind 14 minutes into Alex McLeish’s first game back in charge of Scotland and Marco Urena’s goal proved to be the winner. A Scotland line-up featuring four new caps was slow to get going but they did create a steady flow of chances and showed more urgency after the interval. As well as debutants Scott McKenna, Scott McTominay, Kevin McDonald and Oli McBurnie, Tom Cairney won his second cap while Jamie Murphy also made his international bow as a late substitute. McLeish also introduced a new formation with three central defenders and Cairney and Matt Ritchie tucked in either side of McBurnie up front. There might be more experience in McLeish’s team for Tuesday’s friendly in Hungary and Mulgrew was pleased with the second-half improvement. “A bit better second half, we upped the tempo a wee bit,” the Blackburn player said. “We made a few tweaks at half-time. So there were some positives to take from the game. “It’s difficult when it’s a friendly but it’s up to us to create the atmosphere. The first half we didn’t press as a team or sit off as a team and I think that’s where we got most of our problems. “We sorted that at half-time and there were definitely encouraging signs. The message was nice and clear to get pressing and get up higher and you saw that in the second half, they never had much and I thought we dominated. There were some isolated jeers at half-time, although an experimental Scotland side were always going to find it difficult against settled opponents who are bound for the World Cup. But Mulgrew is keen to get back to winning ways as quickly as possible. The 32-year-old captained his country for the first time during the friendly. “It was a proud moment,” the Blackburn skipper said. “All my family were here, my mum, my sister, my boys and my wife.